Product code: W462 Categories: Sold Items, Sold Watches. Here is a watch straight from the fabulous 1920’s Art Deco era with all the characteristics of such an elegant and decadent time gone by. Made by the Abra Watch Company in Switzerland, this watch is fitted into a platinum case and band both set with diamonds in a truly elegant and stylish design. Not only is the case so beautiful but also the dial is wonderful with that fabulous Art Deco font of the numerals that graduate in size as the numbers go around the case. In total there are 68 diamonds that really sparkle and have a total weight of 3.42 carats. However typical of many fine quality Art Deco pieces, the diamonds were not just set in the case and band, rather so much attention and thought has gone into the actual design as well including the larger diamonds on the band set in an open work design. And to show the detail that went further into this watch, it has been beautifully hand engraved along the edge of both the watch case and the band. Inside there is the 17 jewelled manual wind movement that has just come back from a full service, runs great and comes with our twelve month warranty. Laid out from end to end, the watch measures 16cm and the watch case 2.6cm by 1.7cm across plus the crown. 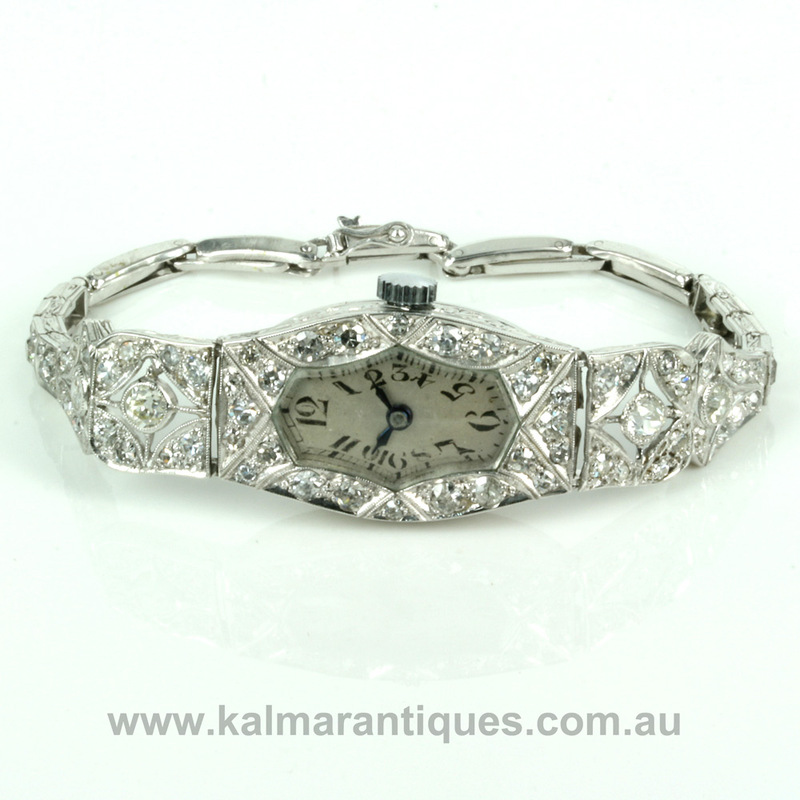 There is no doubt that this is one of the most elegant and stylish Art Deco diamond watches around that is just as much a watch as it is a piece of jewellery.